Now let’s interpret some graphs or data plots of Schumann excitation. Image Source. 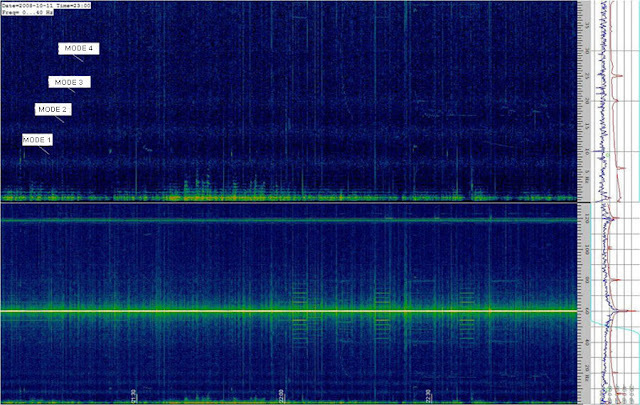 This is a two hour spectrogram between the hours of 2100 and 2200 UTC for the 11th of October 2008. In this spectrogram the first four resonances are labeled with the fourth being very hard to see. Again, this is using the ELF receiver pictured above and a 300′ long wire in an ‘L’ configuration. In the above image we see a measurement taken by an amateur scientist who wanted to confirm the earth cavity theories at a personal level. In this plot from the 13th of November, 2014, a large scale excitation event caused the four modes mentioned earlier (7.83,14.3, 20.8, 27.3 and 33.8 Hz) to spike in activity— the right-hand side of the graph. The “spike” in energy is some kind of excitation event, which energized frequency ranges all the way up to 32 Hz. The fact that the resonances were excited is what makes the spike appear in the graph; however, the Schumann Resonance scale (the potential set of frequencies) has not changed and this appears to be the source of the confusion. The value marked by the red arrow, or close to it, is the fourth mode, 27.3 Hz—a frequency within the Schumann range. The Schumann resonance (SR) is defined as a set of resonant modes or spectrum peaks, between 7.83 and 45 Hz, in the extremely low frequency (ELF) portion of the Earth’s electromagnetic field spectrum. The fundamental Schumann Resonance is a standing wave in the atmosphere around 8 Hz. Human brainwaves are entrained to this pulse emitting theta and alpha frequencies in the same EMF region. Necessary for mammalian growth and repair, such signals in guidewaves in the geomagnetic cavity are the meta-drivers of biological processes, homeostasis and adaptation. We cannot thrive without them. Cells respond between 3 – 25 Hz. Frequencies outside this range have little or no effect. Cell membranes oscillate, or resonate to create a “biological window”. Each “window” has measurable and definable frequency, amplitude and a phase that has discrete ranges projected on different characteristics of the wave. Active “windows” facilitate information transfer and adaptive activities. Changing windows creates functional changes called a phase change that helps us adapt to environmental changes. Outside the earth’s magnetic field for extended periods, early cosmonauts lost 80% of their bone density. Michael Persinger developed Schumann wave generators (7.83 Hz) for space flights that overcame this side effect. Geomagnetic anomalies can amplify local SR in certain geological conditions potentially stimulating coherent resonance in alpha brainwave, forming a tuned system. Solar/geomagnetic interactions correlated with sunspots and solar flares significantly perturb SR. Solar events release cosmic rays which enhance the ionization of the D-layer up to a factor of 10 with Sudden Ionospheric Disturbances (SID). Such ELF signals affect tissue electric gradients of ULF/ELF oscillating signals, involving non-linear resonant absorption of ULF/ELF oscillating signals into systems that use natural ion oscillation signals in the same frequency range. ULF/ELF signals can significantly alter cellular calcium ion fluxes and EEGs in brain tissue. This article concurs with Lewis Hainsworth’s pioneering research on the health correlates of SR, and postulates, along with Pitkanin and Sidorov, that SR may be the substrate for a radar-type extrasensory perception mechanism common to all organisms. SR forms a sort of global guidance system for life. Resonant absorption of an oscillating signal and reaction is presumed as most brainwaves fall within the first five SR modes (0-35 Hz). Frequency matching amplifies even weak signals, even in the presence of other strong static and oscillating fields. It is vital in brain-to-cell and cell-to-cell communication. Geospace is the term that relates to the solar-terrestrial environment and the relevant space occupied by Earth and her fields. Schumann Resonance (SR), global electromagnetic resonances excited by [tropical] lightning, is one of the natural EM fields in our planetary environment. On average, there are about 200 scattered lightning strikes taking place each second. But resonances can be excited by any electromagnetic disturbance in the atmosphere, including geomagnetic micropulsations. Solar or geomagnetic activity leads to changes of the dielectric permeability in the Schumann cavity. The fundamental SR mode roughly corresponds to a wave with a wavelength equal to the circumference of the Earth. It has existed since the Ionosphere formed and lightning began, pre-dating animal life. If a radio wave circles the globe, SR occurs when the phase delay of that wave equals 2π. SR is a global phenomenon, while transverse resonance is local. If the wave bounces between the ground and ionosphere, it is trapped between two ‘mirrors’, kindling transverse resonance. Related Scalar Waves and Tesla Shields (with Diagrams by Tomas Bearden, Phd, MS) | Nikola Tesla — Father Of “Star Wars”? Transverse resonance is predominantly a local phenomenon containing information on the local height and conductivity of the lower ionosphere and on nearby thunderstorm activity. Waves in the ULF range ULF range (i.e., below the first Schumann Resonance), will have wavelengths much larger than the circumference of the Earth. SR is not the internally-generated resonant frequency of our planet, which is 10 – 11.75 Hz as Tesla discovered. Earth itself emits a predominantly infrared wave from its hot core and re-radiated solar energy it absorbs. Schumann fields are weak compared to the earth’s much larger static geomagnetic field, SR is electromagnetic oscillations — the Earth’s global electric circuit consisting of the frequencies that play through the ionospheric cavity (space between the ground and ionosphere) as waves in a plasma. It rings like a tuning-fork. The ionosphere is a highly-conductive region of cosmic plasma, a sea of free electrons – ions. Earth’s cavity responds to solar fluctuations like a tuning fork, tuned to 7.83 Hz. The solar-terrestrial environment is modulated by solar cycles which affect the global climate and all organisms in the biosphere. Interference patterns are the transducers of energy, which at its most fundamental is described as information. Earth functions like a planet-sized electrical capacitor or condenser, storing electrical potential. The space between Earth and the ionosphere is a dissipative closed cavity between 50-375 miles that can sustain quasi-standing waves at wave lengths of planetary dimension. Electrical conductivity in the atmosphere is driven largely by cosmic rays that generate a torsion field. Conductivity increases exponentially with altitude because the lower atmosphere buffers collision frequency. The ionosphere begins about 50 miles out from the Earth’s surface and extends out over 180 miles. It consists of charged particles. This highly dynamic region is constantly exposed to harsh ultraviolet radiation from the Sun. It breaks down molecules and atoms. Highly charged ions and free electrons therefore fill the ionospheric layers creating a “spectral power station”. Through ducted propagation, lightning radiates broadband EM fields that spread laterally into the cavity. Global thunderstorms excite the Schumann resonances, which can be observed around 7.8, 14, 20, 26, 33, 39 and 45 Hz. Changes occurring in these frequencies are quite normal and do not indicate anything out of the ordinary. All of these frequencies fluctuate around their nominal values. The resonant spectrum is a superposition of global lightning discharge. For these resonant values to change, the planet would have to change diameter. Frequencies describe periodic cycles per second, measured in hertz (Hz). Such frequencies have wrapped earth’s biosphere since its inception. Normal daily variation ranges ± 0.5 Hertz. Another normal source of fluctuation is Coronal Mass Ejections from the sun that leads to proton bombardment. Bursts may increase of the Schumann frequency by 3.5%. These effects are explained by changes of the height and dielectric permeability of the Earth-ionosphere cavity. In the early to mid-1950s, geophysicist Schumann suggested that electromagnetic signals might circulate at extremely low frequencies in the electrically resonant cavity between the Earth and the ionosphere. He was right. The signals came to be called “Schumann’s resonances”. One major component was originally predicated at a frequency of about 10 Hz. In 1959 it was measured to be slightly different. Meanwhile, the military co-opted the discovery for using ELF signals in submarine communications. The first mode of these circulating signals has an average value of 7.8 Hz, with a typical diurnal range of from 7.2 to 8.8 Hz, and the second mode has an average value of 14.1 Hz and a range of from 13.2 to 15.8 Hz. These match the brain-wave theta rhythm and beta rhythm nicely. The blank range between the two modes is a very reasonable match with the normal frequency range of the human alpha rhythm, between 8 to 12 Hz or cycles. Additionally, it was found that there is minimum (zero) power circulating in the Earth/ionosphere cavity at 10.4 Hz–which is virtually an exact match for the average value of the alpha rhythm. The existence of these natural signals and the close relationship of their frequencies of oscillation to key human rhythms were unknown to senior neurologists and mental health specialists as late as 1975. But recent years have seen escalating interest in geophysics in both the public and academic sectors, including its effects on our psychobiology. We are bathed in a sea of natural low-frequency electromagnetic (EM) fields from conception to death. The brain is an electromagnetic system synchronized by the Schumann Resonance signal, that that continuously stabilizes the brain wave activity. The frequencies of EEG brainwaves coincides with the range of SR activity. Blackman (1990) established that external electromagnetic ELF signals induce altered neuron calcium ion effluxes in brain tissue. Stablesynchronizing of the brain’s electromagnetic systems underpin thinking, emotion, memory and intelligence. SR modulates the set points of our consciousness and biology. Living tissues detect, absorb and utilized electromagnetic signals within some frequency ranges and completely ignore other frequencies naturally encountered in the frequency spectrum. We are “in tune” with Schumann Resonances which drive brain wave ELF patterns in a set range of grouped frequencies. Some describe “antenna” like qualities in the brainwave 8-12 cycle range. We have electromagnetic transmitters and receivers in our neurons, including a phase locked loop system. Our brains detect and respond to the SR signal through nonlinear resonant matching of frequency, altering optimal melatonin/serotonin cycle balance, cardiac, neurological, reproductive health and mortality. Solar storms modulate daily variation of the D-Region reflected in daily variation in the Schumann Resonance signal strength. This primal lightning-driven Schumann Resonance pulse calibrates us and enhances our physical and mental well-being. We are all tuned to that wave, which correlates with a relaxed and creative mind. That natural resonance helps us achieve our optimal brainwave states, but this atmosphere-to-human linkage is disrupted by the electrosmog of today’s ultra-technology. Cherry (2002) found that the Schumann Resonance signal is extremely highly correlated with Solar Geomagnetic Activity (S-GMA) indices of sunspot number and the Kp index. The physical mechanism is the ionospheric D-region ion/electron density that varies with S-GMA and forms the upper boundary of the resonant cavity in which the Schumann Resonance signal is formed. His evidence supports the notion that SR signals are the S-GMA biophysical mechanism, primarily through a melatonin mechanism. He therefore identifies S-GMA as a natural hazard with biological and health effects. Away from artificial noise and thunderstorms SR is the main component of the natural EM background between 6 and 50 Hz. The fundamental Schumann frequency fluctuates between 7.0 Hz. to 8.5 Hz. Such frequencies vary from geological location to location. They can even have naturally occurring interruptions. Schumann’s successor, Dr. Herbert König demonstrated a connection between Schumann Resonance and brain rhythms. König compared human EEG recordings with natural electromagnetic fields in the environment, finding that 7.83 Hz is the dominant brain wave rhythm of all mammals in alpha or resting state. When the brain resonates with SR energy information is transmitted that appears to coordinate psychophysical systems. Lewis B. Hainsworth, (deceased) of Western Australia was among the first researchers to recognize the relationship of brain-wave frequencies to the naturally circulating rhythmic signals of SR. Hainsworth shared this data with Dr. Robert O. Becker, noted electromagnetic pollution expert, and to Harvard neurologists as early as 1975. Becker included it his three classic books on electromagnetism and life (1982, 1985, 1990). Robert C. Beck, another EMF researcher, found that the human body has numerous very specific frequencies that trigger production of different endorphins, beta-endorphins, catecholamines, enkephalins, dynorphins, proteins, and stem cells. He found about 250 different key frequencies that trigger the body to produce its own healing chemicals. Beck studied about 150 different brain wave stimulation devices, and their effects experimentally. Bentov found that several other interlocking resonating systems in the body were activated by this steady 7 to 8 Hz activity during meditation. The upper part of the body has a resonant frequency of about 7 Hz under normal conditions. Bentov noted that additional resonance effects are likely, resulting from this “phase interlock phenomenon”. 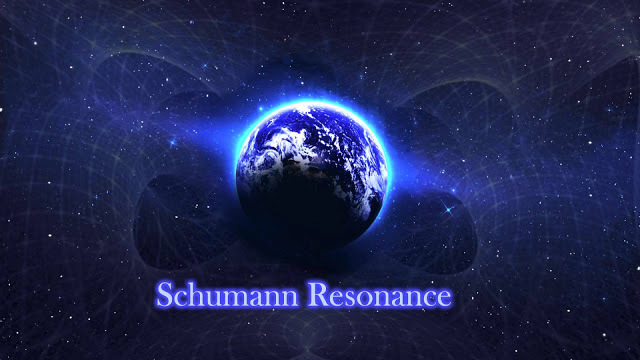 Research has shown that the Schumann resonances can modulate human health indicators such as blood pressure, cardiac and neurological disease, reaction time, neuroendrocrine sensitivities, violence and war. It also correlates with sunspot activity, mass human excitability, sociality, and climate change (Tchijevsky). Suitbert Ertel (1997) in “Bursts of creativity correlate with solar activity” examined the association between solar activity and oscillations in human creativity. His results showed that during increased solar activity, human creative activity also peaks. Tchijevsky agreed that the influence on human nervous systems is greatest during peaks of emitted energy by the sun and radiation of the earth. Chemical bonds are magnetic bonds, formed between adjacent atoms through paired electrons having opposite spins and thus attracted magnetically. In 1977, this phenomenon — the relationship between brain-wave rhythms and the spectrum of the natural Earth ELF (extremely low frequency) signals–became the basis for Itzhak Bentov’s popular book Stalking the Wild Pendulum(Dutton, 1977). He also suggested geophysical correlates affect people’s health, emotional balance and spiritual well-being. Ancient cultures such as Egyptian, Hopi, Ancient Indian, Mayan, Aztec and Chinese, correctly assumed that their collective behavior was influenced by the sun. Contemporary research confirms a relationship to human health and well-being. Even ESP or psi phenomena is predicated on the assumption that all living things are interconnected and communicate with each other via biological and electromagnetic fields. Hainsworth sent up a clarion cry against hazardous EM (electromagnetic) pollution, whose continuous dangers pale in comparison to the threat of technologies such as HAARP [High-frequency Active Auroral Research Program], which sends violent pulsations into the Earth’s ionosphere, potentially disrupting the entire electromagnetic shield of the planet and certainly affecting the whole biosphere and thus human welfare in general. Some research (Braden) has suggested that the frequency of the basic Schumann’s resonance has recently been rising in value, possibly threatening the whole biosphere, human welfare and our evolutionary future. But this is totally unsubstantiated fallacious disinformation. There is no evidence whatsoever of rising SR. The author’s colleague Ben Lonetree has been monitoring SR daily for nearly two decades without any anomalous readings, proving the persistent New Age meme is undeniably incorrect. All biological processes are a function of electromagnetic field interactions. EM fields are the connecting link between the world of form and resonant patterns. They store gestalts or patterns of information. The bridge connecting solar system resonances and brain frequencies resides in our human DNA helix, which co-evolved in the Earth’s environment. Electrical engineer Lewis B. Hainsworth, MA, was among the first to suggest that human health is linked with geophysical parameters by way of the naturally occurring Schumann’s ELF. His hypothesis identified naturally occurring features which determine the frequency spectrum of human brain-wave rhythms: The frequencies of naturally occurring electromagnetic signals, circulating in the electrically resonant cavity bounded by the Earth and the ionosphere, have governed or determined the ‘evolution’ or development of the frequencies of operation of the principal human brain-wave signals. In particular, the alpha rhythm is so placed that it can in no circumstances suffer an extensive interference from naturally occurring signals. The nature of the applied stimulus makes it difficult to identify the responses directly, as they are most likely to occur in the form of stress-related conditions. They will therefore show up as drastic increases in mental disturbance, antisocial behavior, psychosomatic conditions and neurological disturbances. Some electrical field phenomena have already been linked with abnormal cell growth and a decrease in immunocompetency. All these factors could be expected to lead to the appearance of “new” diseases, probably accompanied by a decline in resistance to many minor infections, an increase in conditions related to abnormal cell development, including cancer, birth defects and infertility, and an increase in psychological disturbance problems, e.g., drug addiction and suicide. These existing psychobiological problems could be expected to increase in scale, but could be studied for deviations from “normal” alpha cycles of 10.4 Hz, with detectable changes in psychological characteristics and mental abilities. Hainsworth therefore strongly urged that research into widespread measurements of the natural SR signals’ frequency variations and field strengths be carried out and compared with statistics for the incidence of heart attacks, suicide attempts, road accidents, social violence, domestic accidents, crimes, etc. Studies are often conducted in this inferential way (i.e., Krippner and Persinger), searching correlations between the phenomena of Earth lights and tectonic strain and reports of UFO sightings, abduction reports and other anomalous psychophysical experiences for an electromagnetic connection to temporal lobe seizures. We strongly suggest that correlations of broad changes in the modulations of SR be studied in relationship to microwave radiation, ELF signals and HAARP for both immediate and long-term consequences. We have discussed elsewhere the obvious ramifications of such EM pollution and 10-50 Hz modulations on the human system (Miller, “Synthetic Telepathy”, 2001). Oscillators alter the environment in a periodic manner. Thus, standing waves in the body, whether during meditation/relaxation or not, can be driven by a larger signal. Progressively amplified wave-forms, created by resonance, result in large oscillations entraining other circuits in the body tuned to those frequencies. A hierarchy of frequencies thus couples our psychophysical selves to the harmonic frequency of the electrical charge of the Earth, which naturally pulses at the same frequencies. This is hardly a coincidence, as we are adaptive products of our environment. Our planet is surrounded by a layer of electrically charged particles called the ionosphere. The lower layer of the ionosphere is roughly 60-80 kilometers (40-50 miles) from the crust, and this charged layer is known to reflect radio waves. Bombardment by HAARP signals “pushes” out this boundary layer, thus altering the natural, pulsating rhythm. Natural fluctuations in frequency occur daily, by the lunar month, and in response to solar flares. Since the ionosphere is a highly charged layer, it forms a so-called capacitor with the Earth. This means that there is a difference in electrical potential between the two, the Earth being negatively charged and the ionosphere being positively charged. This potential varies somewhat, but is around 200 volts per metre. This is a fundamental type of electrical generator. The solar winds, interacting with the upper atmosphere rotation, act as the collector and brushes of a generator. The lower atmosphere can be seen as a storage battery for this gradient potential. A “tuned system” consists of at least two oscillators of identical resonant frequencies. If one oscillator starts emitting, the other will be activated by the signal very shortly, in the process of resonance, entrainment or kindling (igniting the resonance phenomenon among the neurons). It becomes obvious that in deep meditation, when waves of alpha and theta rhythms cascade across the entire brain, a resonance is possible between the human being and the planet. Energy and information which are embedded in a field are transferred. Perhaps the planet communicates with us in this primal language of frequencies. According to Hainsworth, the influence of naturally occurring Schumann’s resonance signals on brain-wave pattern evolution is formally stated to show that low-power electrical fields could produce evolutionary change. The electrical fields produced by modern electro-technology are then possible sources of evolutionary change. The characteristics of some forms which might result should be considered. Some fields might inhibit survival of existing forms. Because of lack of available data, precise measurements are lacking and must therefore be quantitatively valueless. Technology not only will change, but is changing, human evolution. Only extensive investigation of the naturally occurring signals will give any lead in showing what results might occur. The possibility exists that human health is linked with geophysical parameters by way of the naturally occurring Schumann’s resonances. A number of attempts have been made to discover the correlation through geomagnetic and ionospheric storms. The correlation comes through the biological fact that the human system is apparently sensitive to such low-power ELF signals. We don’t know what the range of such a correlation might be. The frequency values of the SR signals are determined by the effective dimensions of the cavity between the Earth and ionosphere. Thus, any events which change these dimensions will change the resonant frequencies. As Hainsworth warned, “such events could be ionospheric storms, and could even result from a man-made ionospheric disturbance”. Geomagnetic storms are the magnetic changes produced by ionospheric storms, and are thus associated with conditions capable of changing the SR signals. However, although such storms can produce these changes, measurement of these parameters cannot give any indication of whether the resonance signals have changed to a value outside their normal range or not. 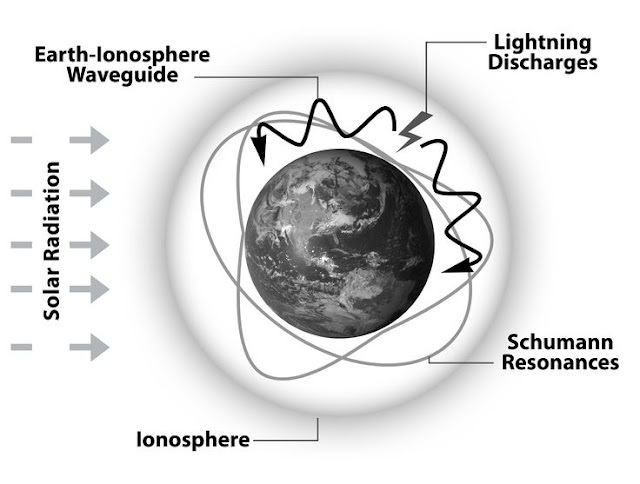 Since the undisturbed state of the ionosphere corresponds to the normal SR patterns, then ionospheric disturbances are likely to produce abnormal patterns, but will not necessarily do so in all cases. If biological response is linked to Schumann’s resonance signals, this will reduce any apparent link with geomagnetic or ionospheric data. Trying to determine the relationships between geophysical and biological conditions can become extremely complex. The frequencies of the SR signals change with ionospheric conditions. These conditions change diurnally, seasonally and with variations in solar activity, which, in turn, varies with the 11-year sunspot cycle and also with the 27-29-day lunar cycle, mainly during sunspot minimum periods. Lunar tidal changes in the height and thickness of the layers could also sometimes affect the cavity dimensions and hence the Schumann’s frequencies. So can powerful ELF signals from HAARP. If we are sensitive to ELF signals, then when these factors are considered we would expect to get confusion if we try to link any effect with geophysical changes. For instance, there could be incidences of classic states of “lunacy” in some years if damaging signals coincided with full moons, then in other years the observations and analyses would show that the effects were not lunar. An analysis of the correlation between the incidence of ionospheric disturbance and rate of admission to Heathcote Hospital (Perth, Western Australia) for about a three-year total indicated that when a disturbance occurred then the admission rate changed. The probability of the association being random was of the order of 2000:1 against. However, the fact that sometimes the rate went up and sometimes down showed that ionospheric storms changed the rate of incidence of mental disturbance in a way that is consistent with that change being dependent on the actual causes being linked to variations in the Schumann’s resonance signals. At that point, Hainsworth decided to concentrate on trying to get some observational work going on measuring the SR signals. Hainsworth’s set-up used a 2,000-turn, 1-metre-square antenna, and another of 1/3-metre square, plus amplifiers to handle signals from 0 to 30 Hz. His amplified Schumann’s signals were analyzed in a laboratory. On one occasion the signal dropped to zero amplitude when a solar flare occurred, and did not start recovering for about an hour and a half afterwards. It was originally just under 7 Hz and came back at only just over 6 Hz. His next step would have been to develop a wave analyzer to try to pick out individual signals. But the failing health of both himself and his wife prevented this. Hainsworth posed a series of questions, all of which are answered with a resounding “yes”. This should lead us in the direction of extreme caution towards introducing new EM or ELF sources and ionospheric changes in our environment. He presented his data in two papers (referenced at the end of this article and posted on the website http://www.nwbotanicals.org). 3. Does it respond to audible signals at these frequencies? Brain waves have only been studied since about the mid-1920s, and the signal form that is apparently most widely known and identified is the alpha rhythm. The frequency of this signal varies from individual to individual, but it lies between about 7-8 Hz and 12 Hz, with an average value of 10.5 Hz. Theta and beta rhythm signals also occur, and are identifiable by EEG below the 8 Hz and above the 12 Hz frequencies. Since the discovery and measurement of these signals, a great deal of effort has been devoted to trying to work out how they originated in the first place and what determines their frequencies of operation. Hainsworth argued that up to the end of 1979, no long-term systematic measurements of any great value were being made of the Schumann’s resonance signals. Measurements were being made only intermittently for the purpose of obtaining research data for use by post-graduate geophysicists in constructing esoteric mathematical models of the ionosphere. It follows from this that, until long after the end of 1979, no figures on these signals were available. Consequently, no “expert” can produce numerical evidence to support an objection to Hainsworth’s original hypothesis, since the only numerical values available are those favoring it. Schumann’s resonances are actually observed, by experiment, occurring at several harmonic frequencies between 6 and 50 cycles per second (one cycle equals one hertz). Specifically they are found at 7.8, 14, 20, 26, 33, 39 and 45 Hz, with a daily variation of around ±0.5 Hz. Only as long as the properties of Earth’s electromagnetic cavity remain about the same do these frequencies remain the same. Cycles may vary somewhat due to ionospheric response to solar cycle activity and properties of the atmosphere and magnetosphere. Projects, such as HAARP, which heat up or blast out the ionosphere pose a potential threat of catastrophic proportions to this interactive system. Even at the turn of this millennium, Hainsworth seems to have been unfamiliar with extensive work in brain-wave research in neurology, hypnotherapy, biofeedback and neural feedback. This research includes extensive experiments in frequency-following response (FFR) and relating brain waves and brain-wave deficiencies to psychobiological states. The brain is a massive source of ELF signals that get transmitted throughout the body through the nervous system, which is sensitive to magnetic fields. Brain waves and natural biorhythms can be entrained by strong external ELF signals, such as stationary waves at Schumann’s resonances. Entrainment, synchronization and amplification promote coherent large-scale activity rather than typical flurries of transient brain waves. Thus, resonant standing waves emerge from the brain, which under the right conditions facilitates internal and external bio-information transfer via ELF electromagnetic waves. These SR waves exhibit non-local character and nearly instant communication capability. The EEG (electroencephalograph) measures brain waves of different frequencies within the brain. Rhythmicity in the EEG is a key variable in the coordination of cortical activity. Electrodes are placed on specific sites on the scalp to detect and record the electrical impulses within the brain. Frequency Amplitude represents the power of electrical impulses generated by the brain. Volume or intensity of brain-wave activity is measured in microvolts. is the number of times a wave repeats itself within a second. It can be compared to the frequencies on a radio. Raw EEG frequency bands include gamma (25-60 Hz); beta (12-25 Hz); alpha (7-12 Hz); theta (4-7 Hz); and delta (less than 4 Hz). Their ranges overlap one another along the frequency spectrum by 0.5 Hz or more. These frequencies are linked to behaviors, subjective feeling states, physiological correlates, etc. Clinical improvement with EEG biofeedback is traceable to improved neuroregulation in basic functions by appeal to their underlying rhythmic mechanisms. Schumann’s resonance forms a natural feedback loop with the human mind/body. The human brain and body developed in the biosphere, the EM environment conditioned by this cyclic pulse. Conversely, this pulse acts as a “driver” of our brains and can also potentially carry information. Functional processes may be altered and new patterns of behavior facilitated through the brain’s web of inhibitory and excitatory feedback networks. Functional processes may be altered and new patterns of behavior facilitated through the brain’s web of inhibitory and excitatory feedback networks. The brain has its own set of vibrations it uses to communicate with itself and the rest of the body. EEG equipment distinguishes these waves by measuring the speed with which neurons fire in cycles per second. At their boundaries these waves can overlap somewhat, merging seamlessly into one another–so different researchers may give slightly different readings for the range of cycles per second (Hz). The rate of cycling determines the type of activity, kindling wave after wave over the whole surface of the brain by igniting more neurons. Brain Waves (8 to 12 cycles per second) This brain wave indicates a relaxed state of mind.. State of relaxed alertness, good for inspiration and learning facts fast. A meditative mind. In this state tap into internal “antenna” like qualities. Visions, powerful ideas, mindless creation of the incredible. Internal feeling & sensations. Theta Brain Waves (4 to 8 cycles per second) Deep meditation. Deep inward thought. This is associated with life-like imagination. High state of mental concentration. A magical mind. Internal pictures / visualization. Intuition, inner guidance. Access to unconscious material. Dreaming. Studies have shown that learning in Alpha State enhances the performance of students. It also develops the interest of studies in students more than they have ever learned in tense environment. Frequent gaps of 2 to 3 minutes after every 30 minute study period relaxes their minds and the alpha state will prove its efficiency with great ease and fun. But learning is more than just absorbing information, so changing the state of mind to operate Beta, Alpha and Theta is most likely to produce the best learning, cognition and creativity, while also staying in a relaxed state. Gamma waves (25-60 Hz) appear to relate to simultaneous processing of information from different brain areas, e.g., involving memory, learning abilities, integrated thoughts or information-rich task processing. Gamma rhythms modulate perception and consciousness, which disappear with anesthesia. Synchronous activity at about 40 Hz appears involved in binding sensory inputs into the single, unitary objects we perceive. Beta waves (12-25 Hz) dominate our normal waking state of consciousness when attention is directed towards cognitive tasks and the outside world. Beta is a “fast” activity, present when we are alert or even anxious, or when engaged in problem solving, judgement, decision making, information processing, mental activity and focus. Nobel Prize winner Sir Francis Crick and other scientists believe the 40 Hz beta frequency may be key to the act of cognition. Alpha waves (7-12 Hz) are present during dreaming and light meditation when the eyes are closed. As more and more neurons are recruited to this frequency, alpha waves cycle globally across the whole cortex. This induces deep relaxation, but not quite meditation. In alpha, we begin to access the wealth of creativity that lies just below our conscious awareness. It is the gateway, the entry point that leads into deeper states of consciousness. Alpha waves aid overall mental coordination, calmness, alertness, inner awareness, mind/body integration and learning. Alpha is also the home of the window frequency known as the SR, which propagates with little attenuation around the planet. When we intentionally generate alpha waves and go into resonance with that Earth frequency, we naturally feel better, refreshed, in tune, in synch. It is, in fact, environmental synchronization. Theta waves (4-7 Hz) occur most often in sleep but are also dominant in the deepest states of meditation (body asleep/mind awake) and thought (gateway to learning, memory). In theta, our senses are withdrawn from the external world and focused on the mindscape–internally originating signals. Theta waves are associated with mystery, an elusive and extraordinary realm we can explore. It is that twilight state which we normally only experience fleetingly as we rise from the depths of delta upon waking or drifting off to sleep. In theta, we are in a waking dream; vivid imagery flashes before the mind’s eye and we are receptive to information beyond our normal conscious awareness. Theta meditation increases creativity, enhances learning, reduces stress and awakens intuition and other extrasensory perception skills. Delta waves (0-4 Hz) are the slowest but highest in amplitude. They are generated in deepest meditation and dreamless sleep. Delta waves confer a suspension of external existence and provide the most profound feelings of peace. In addition, certain frequencies within the delta range trigger the release of a growth hormone which is beneficial for healing and regeneration. This is why sleep, deep restorative sleep, is so essential to the healing process. Rhythm & Harmonic Resonance There is a harmonic relationship between the Earth and our mind/body. Earth’s low-frequency iso-electric field, the magnetic field of the Earth and the electrostatic field which emerges from our body are closely interwoven. Our internal rhythms interact with external rhythms, affecting our balance, REM patterns, health, and mental focus. SR waves probably help regulate our bodies’ internal clocks, affecting sleep/dream patterns, arousal patterns and hormonal secretion (such as melatonin). The most important slow rhythm is the daily rhythm sensed directly as the change in light. Rhythms connected with the daily rhythm are called circadian (an example is pineal gland melatonin secretion). Some experiments in the absence of natural light have shown that the basic human “clock” is actually slightly longer than one day (24 hours), and closer to one lunar day (24 hours 50 minutes). On a slower scale, a strong influence on the Earth is its geomagnetic field, which is influenced by the following periods: the Moon’s rotation (29.5 days); the Earth’s rotation (365.25 days); sunspot cycles (11 or 22 years); the nutation cycle (18.6 years); the rotation of the planets (88 days to 247.7 years); and the galaxy’s rotation cycle (250 million years). Very important rhythms, like hormone secretion and dominant nostril exchange, are in the order of 1-2 hours. In the range of human EEG, we have the Sun’s electromagnetic oscillation of 10 Hz, while the Earth/ionosphere system is resonant at frequencies in the theta, alpha, beta-1 (low or slow) and beta-2 (high or fast) bands. Different species often have internal generators of environmental rhythms, which can be extremely precise, up to 10-4. The frequency of these oscillators is then phase-locked-loop (PLL) synchronised with the natural rhythms. Environmental synchronization sources are often called zeitgebers. The mechanism of optical synchronization can be shown. The presented rhythms should inspire a better understanding of the interaction of internal and external rhythms during specific states of consciousness. Brain waves indicate the arousal dimension, and arousal mediates a number of conditions. Changes in sympathetic and parasympathetic arousal “tune” the nervous system. Underarousal leads towards unipolar or reactive depression, attention deficit disorder, chronic pain and insomnia. Overarousal is linked with anxiety disorders, sleep onset problems, nightmares, hypervigilance, impulsive behavior, anger/aggression, agitated depression, chronic nerve pain and spasticity. A combination of underarousal and overarousal causes anxiety and depression as well as ADHD. Instabilities in certain rhythms can be correlated with tics, obsessive-compulsive disorder, aggressive behavior, rage, bruxism, panic attacks, bipolar disorder, migraines, narcolepsy, epilepsy, sleep apnoea, vertigo, tinnitus, norexia/bulimia, suicidal ideation and behavior, PMS, multiple chemical sensitivities, diabetes, hypoglycaemia and explosive behaviour. The brain responds to inputs at a certain frequency or frequencies. The computer can create wave-form patterns or certain frequencies that compare with the mind’s neural signals in terms of mind patterns. If people can control their mind patterns, they can enter different states of being (mental relaxation, study, etc.). So what happens when the mind is entrained with a sound or vibration that reflects the thought patterns? When the mind responds to certain frequencies and behaves as a resonator, is there a harmonic frequency that the mind vibrates to or can attune to? What does the study of harmonic resonance, sound or vibration have to do with the brain’s frequency waves? Entrainment is the process of synchronization, where vibrations of one object will cause the vibrations of another object to oscillate at the same rate. External rhythms can have a direct effect on the psychology and physiology of the listener. Slower tempos from 48 to 70 BPMs have been proven to decrease heart and respiratory rates, thereby altering the predominant brain-wave patterns. Binaural beats are continuous tones of subtly different frequencies, delivered to each ear independently in stereo via headphones. If the left channel’s pitch is 100 cycles per second and the right channel’s pitch is 108 cycles per second, the difference between the two equals 8 cycles per second. When these sounds are combined, they produce a pulsing tone that waxes and wanes in a “wah wah” rhythm. Earth’s background base frequency, or “heartbeat” (Schumann’s resonances), fluctuates BUT IS NOT RISING dramatically, despite a New Age meme that alleges it. The authors have been unable to substantiate a rising SR in the literature and Ben Lonetree’s readings directly contradict it. SR is stable; it is NOT rising. Though it varies between geographical regions, for decades the overall measurement has remained 7.8 cycles per second. This was once thought to be a constant. Global military communications were developed using this frequency. As previously stated, the Earth behaves like an enormous electrical circuit. The atmosphere is actually a weak conductor; and if there were no sources of charge, its existing electrical charge would diffuse away in about 10 minutes. There is a “cavity” defined by the surface of the Earth and the inner edge of the ionosphere, whose height fluctuates somewhat. It’s been calculated that at any moment, the total charge residing in this cavity is 500,000 coulombs. There is a vertical current flow between the ground and the ionosphere of 1 – 3 x 10-12 amperes per square meter. The resistance of the atmosphere is 200 ohms. The voltage potential is 200,000 volts. There are about 2,000 lightning storms at any given moment worldwide. Each produces 0.5 to 1 ampere, and these collectively account for the measured current flow in the Earth’s “electromagnetic” cavity. Schumann’s resonances are quasi standing-wave electromagnetic waves that exist in this cavity. Like waves on a string, they must be potentiated or “excited” in order to be observed. They are not caused by internal terrestrial factors or Earth’s crustal movements or the core, which does produce magnetic fields. They seem to be related to electrical activity in the atmosphere, particularly during times of intense lightning activity. So long as the properties of Earth’s electromagnetic cavity remain about the same, these frequencies remain the same. Presumably there is some change due to the solar sunspot cycle, as the Earth’s ionosphere changes in response to flares and mass ejections during the 11-year cycle of solar activity. High-energy charges coming off the Sun brush across the upper atmosphere, ionising there. Since the Earth’s atmosphere carries a charge, a current and a voltage, it is not surprising to find such electromagnetic waves. The resonant properties of this terrestrial cavity were first predicted by W. O. Schumann in 1952 and 1957, and first detected by Schumann and Konig in 1954. Between the nearly perfectly conducting terrestrial surface and ionosphere, a resonating cavity is formed. Broadband electromagnetic impulses, like those from lightning flashes, fill this cavity and create globally the so-called Schumann’s resonances at frequencies in the range of 5-50 Hz (Schumann, 1952; Bliokh et al., 1980; Sentman, 1987). The nominal average frequencies observed are 7.8, 14, 20, 26, 33, 39 and 45 Hz, with slight diurnal variation (Sentman and Fraser, 1991). Standard magnetometers are not able to measure Schumann’s resonances, and even the search coil (i.e., pulsation) magnetometers, which most often sample at about 0.1 Hz, do not allow such studies. Special equipment is thus needed (see, for example, Sentman and Fraser, 1991). 1. Schumann’s resonances are actually observed by experiment to emerge at several frequencies related to brain waves. They range between 6 and 50 cycles per second, specifically 7.8 (alpha), 14 (low beta), 20 (mid beta), 26 (high beta), 33 (low gamma), 39 (gamma) and 45 Hz (gamma), with daily variation of about ±0.5 Hz. 2. The strongest of the seven resonances is 7.83 Hz, in the alpha brain-wave range. If the rise in resonance continues, this primary resonance, the Earth pulse, changes from sub-band low alpha (7-10 Hz) to sub-band high alpha (10-12 Hz), perhaps influencing our ability to relax deeply, balance and integrate our mind/body connection. It could influence REM sleep and dreaming. If it continues to rise, it will breach the threshold into “fast” beta activity. Low beta (12-15 Hz) is associated with lack of focused attention, and can even indicate attention deficit disorder. 3. The amplitude (i.e., intensity) of the Schumann’s resonances is not constant, and appears to be extremely dependent upon tropical (and hence global) temperature. Indeed, preliminary results seem to indicate that a mere one-degree increase in temperature correlates with a doubling of the SR. This could not be more significant, as it is unknown what psychobiological effect these fluctuations could have on humans. One of the most crucial questions in science today centers on whether or not the planetary temperature is rising, falling or remaining unchanged. Recently global warming has been acknowledged by most in the field, and human interference (technology) is implicated. Yet, there is evidence the whole solar system is heating with the solar cycle. On one hand, analyses of thermometer measurements of near-surface global (land and sea) air temperatures suggest the planet has been warming in recent decades. But satellite measurements of the planet’s lower atmospheric temperature show no warming from 1979 to 1998. Temperature data from weather balloons launched throughout the world reveal variations and trends in global temperatures that correspond to those found in the satellite-based measurements. Analysis of pressure thickness measurements from these same balloons also shows no warming in recent decades. It’s no wonder we have such an ongoing “heated debate” about the recent temperature history of the Earth! Yet most people recognize that their local weather is markedly different than in past decades. Scientists have suggested lately that another method may exist to monitor planetary temperature accurately. The idea is simple, though the underlying physics of the processes is complex. The method is based on the well-known fact that thunderstorms and lightning strikes in many parts of the world are directly related to lower-atmospheric air temperatures. Higher temperatures produce more lightning strikes, while lower temperatures tend to depress lightning activity. Lightning discharges occurring anywhere in the world produce electromagnetic pulses that spread away from the source. Much of the energy is quickly degraded, but some of the energy the lightning produces falls in the extremely low frequency/long-wavelength domain of the electromagnetic spectrum. At these long wavelengths, the energy from a lightning strike is able to circumnavigate the Earth without serious degradation. This low-frequency/long-wavelength energy creates SR signals which can be detected throughout the world. Understanding SR waves requires a basic appreciation of the vertical structure of the atmosphere. In the upper reaches of the ionosphere, incoming ultraviolet radiation and soft X-rays affect atoms or bonded groups of atoms, causing gains or losses of negatively charged electrons. This interaction creates an environment of positively and negatively charged particles of the high atmosphere that, among other interesting qualities, can readily conduct electricity. The bulk of our insulating atmosphere lies between two conducting layers of the Earth’s surface and the lower boundary of the ionosphere. This spherically concentric cavity, the Earth/ionosphere cavity, is bounded by those electrically conducting walls. Again, lightning discharges within the cavity produce electromagnetic pulses that spread away from the source in the extremely low frequency domain, and the conductive walls of the cavity produce some interesting effects for the low-frequency energy. For example, energy with a frequency near 7.5 Hz would have a wavelength of about 40,000 km (recall that wavelength = speed of light / frequency). Because this wavelength equals the circumference of the Earth, the energy is able to circumnavigate the Earth/ionosphere cavity without serious degradation. The 100 or so lightning bolts occurring each second in the 1,000 lightning storms around the world contribute to the energy in the 7.5 Hz portion of the spectrum, which can be measured anywhere on the planet. It is these resonance properties of this global spherical capacitor or resonator) that Schumann predicted over 40 years ago. In an article published in Science, MIT scientist Earle Williams (1992) constructed a powerful argument that links Schumann’s resonances to convection and ultimately to widespread tropical and/or global temperature. Williams concluded that a 1°C warming in the tropics should result in a fourfold increase in lightning activity, and he presented empirical data from several locations to support his conclusion. He noted that any measurable parameter nonlinearly related to temperature could be extremely useful in assessing the most subtle changes in global temperature. Others have presented different sensitivities: Price (1993) concluded that a 1°C warming would increase global lightning activity by 7%; Price and Rind (1994) found a 5-6% increase per 1°C sensitivity; while Reeve and Toumi (1998) found the sensitivity to be near 40% per 1°C. Regardless of the exact sensitivity, all these scientists conclude that lightning increases with even moderate amounts of warming worldwide. More lightning would generate a stronger SR, which may be useful in monitoring planetary temperatures. Global warming has been linked to the suspected rise in SR, and is a threat to its synchronization with our brain waves. Small changes in temperature pump up into large signals in extremely low frequency (ELF) resonances. Long-term monitoring and study of global climate changes via measurements of ELF electromagnetic waves needs to be conducted more closely. Monitoring the intensity and frequencies of the lightning-induced ELF SR could help monitor changes in the Earth’s climate over time. One Israeli program proposed setting up two or three widely separated ELF field sites. A suggested site for a permanent SR monitoring station was in the Negev Desert in Israel. Members of this proposal want to develop, test and install the appropriate software for the automatic electromagnetic monitoring and preliminary processing of the incoming data. They suggested that simultaneous measurements could be made in Russia and Sweden to test the global nature of the ELF signals measured in Israel. The continuous ELF data measured in Israel could be compared with other ELF data sets from other locations around the world, such as Hungary, USA or Japan. Furthermore, the relevant global climate data sets – such as surface temperature, satellite observations of the global distribution of deep convection, and global atmospheric water vapour measurements – could be used for comparisons with SR data to check the reliability of the “global thermometer” hypothesis. A systematic study of SR parameters during high-energy particle precipitation events has shown that protons and electrons with energies above 1 MeV ionise the upper boundary of the Earth/ionosphere cavity. This leads to an increase in the resonance frequency and a decrease in the damping of the first Schumann’s resonance, as derived from measurements at Arrival Heights, Antarctica. The study used the nine strongest solar proton events of the past Solar Cycle 22 and high-energy electrons emitted periodically from co-rotating interaction regions in the solar wind during 1994-95. The variation of the SR parameters is in qualitative agreement with current SR theories. The study also showed that high-energy particle precipitation (solar ejecta) is not the only relevant source affecting SR parameters. The findings constitute a so far little-explored aspect of solar/terrestrial interaction. In conclusion, we postulate that: (1) we are complex electrodynamic, rather than merely chemical beings, sensitive to natural and artificial EM fields; (2) SR frequencies coincide with human brain waves, affecting subtle and gross brain-wave generation, regulating homoeostasis, healing and psi; (3) there is strong correlation between human behavioral disturbance and geomagnetic field turbulence or isolation from SR frequencies. As human beings we have extraordinary potentials we have hardly begun to study, much less understand. Creative gifts, intuitions and talents that are unpredictable or emergent may become stabilized in generations to come. Hopefully, we can learn to understand both our emergence from an essentially electromagnetic environment and facilitate our potential for healing, growth and non-local communication. Further research on these electromagnetic relationships is essential, perhaps even to our psychophysical survival as a species. They affect our minds, the cellular and genetic structure of our bodies, our sleep and dream cycles, our emotions, perhaps even our spirit. Monitoring and collating these effects of atmospheric tampering and their potential influence on the ionosphere and SR, therefore human brainwaves and health, should be continued. We are currently in Solar Cycle 24, and should use an entire 11 year cycle to acquire accurate data results, as Hainsworth suggested. A team of researchers and physicists, compiled relevant data under the auspices of the Journal of Non-Locality and Remote Mental Interactions (JNLRMI) edited by Lian Sidorov. They hypothesized that EM fields outside of the body are crucial for our consciousness. Finnish physicist Matti Pikanen developed a model of physics, called Topological Geometrodynamics (TGD), highlighting the close relationship of human physiology with SR and other ELF and electromagnetic patterns. Pitkanen believes that not only global, but interplanetary and interstellar magnetic fields are of great importance for conscious life. His explanations involve magnetic flux tubes, a dipole-like part of a field. A wide range of EM waves, in particular microwaves and radiowaves are likely key elements in homeostasis, remote mental interactions between cells and other structures, and sensory representation, as well as in remote mental interactions both within and outside of the body. He explains that the noise level of Earth’s magnetic field must be low for anomalous cognition (also called psi or ESP) to occur. Alan Frey suggested similar field notions decades ago, speaking specifically of microwave range inputs. These EM fields are only correlates of consciousness. Still, TGD allows the possibility of assigning someone’s field body a topological field quanta identity. Pitkanin also suggests these fields and waves are influential when biological systems perform quantum computation-like processes. His biophysics suggests that neural circuits and molecules are bound by lock and key mechanisms through this process of magnetic circulation (topologically quantized diploar magnetic fields). Pitkanen even sees Earth’s magnetic field as a quantized dipolar magnetic field interaction of knotting, linking, and complex twisting. TGD views the brain and nervous system as a sensory organ for our extended, electromagnetic selves, which have a length scale at least the size of the Earth’s diameter. He suggests further that psi phenomena and distant healing may involve transfer of specific electromagnetic frequencies through Planck-length wormholes and join-along boundaries postulated by TGD, which would allow for the near-instant transfer of information. Other research suggests the fundamental interaction of internal and external fields is the right track. Joseph Jacobson (2002) at MIT, found a way to switch cells off and on with radio waves. His team also “unzipped” and manipulated DNA with a radio-frequency pulse. The same approach worked on proteins as well, and proteins orchestrate nearly all cellular chemical processes. Further, in JNLRMI (Vol. 1, No. 3, 2002) physicist Peter Gariaev has proposed a wave-based genome, whose main information channel is the same for both biophotons and radio waves. In 1973, Miller, Webb and Dickson described DNA as a holographic projector. In other words, genes encode and express themselves via light and radio waves, or acoustical holography (Miller, Miller and Webb, JNLRMI , 2002). Delocalized interference patterns create calibration fields (blueprints) for our bodies’ space-time organization. The system works as a biocomputer — a wave biocomputer. DNA can also function as a gel-like liquid crystal, emitting a weak laser-like light that can be converted into an electro-acoustic signal. Later research by Peter Gariaev and Mae Wan Ho substantiated electromagnetic models of life. Like water bouncing off rocks and other submerged objects, this non-specific SR frequency is absorbed and re-radiated in unique interference patterns by all objects it encounters. This interference pattern is a composite of external and internal properties, as the constituent atoms, molecules and their global assembly all re-transmit this energy according to their specific configurations. The “sounding waves” can be frequency and pattern modulated by conscious intent in order to yield specific information (interference patterns). Decoded by the brain they return almost instantly on the “back” of the Schumann Resonance. Once recaptured, the patterns are then decoded by the brain. In this Fourier-type transformation the information is translated into conscious data, much like other sensory processing. Conversely, specific effects may be imprinted as bioinformation and made to exercise a “mysterious action at a distance”, once the signal wave reaches the target. That pattern, in turn, may, under the right (“pre-requisite”) global conditions, avoid routine dissipation and become instead coupled to the dominating (“state-of-consciousness”) standing wave that is picked up and carried by the Schumann resonance. Mental intent may function as a variable window of transmission/reception in the exchange of extrasensory information. Tuned into the Schumann resonance, it may carry such bio-regulating information to distant targets and act as a primitive, radar-type sensory interface. 1. The organization of all biological systems is established by complex electrodynamic fields. We are fundamentally electromagnetic, rather than chemical beings. Wave interaction is a key determinant of biological structure and optimal functioning. Biosystems are sensitive to natural and artificial electromagnetic fields. Perturbations in environmental fields can induce changes in organisms informed by those fields. Field frequencies and amplitudes affect our biodynamic state. 2. ELF frequencies of Schumann’s Resonance are intimately linked with those of human brainwaves. Natural or artificially induced changes in SR could affect subtle and perhaps gross brainwave generation. In particular, it could lead to changes in patterns and frequencies of resonance and resulting phenomena such as homeostasis, REM, psi, and healing. 3. There is a strong correlation between behavioral disturbances in humans and periods of solar and geomagnetic field turbulence. Conversely, studies show that subjects living in isolation from geomagnetic rhythms over long periods of time developed increasing irregularities and chaotic physiological rhythms – which were dramatically restored after the introduction of a very weak 10Hz electrical field. Early astronauts suffered until SR generators were installed in their spacecrafts. [B]rainwaves (particularly in the alpha range) can be transmitted along the perineural system (or via Frohlich excitation) to any distal parts of the body, and even to adjacent organisms, via ELF EM waves. These frequencies can be amplified by closely-related Schumann resonance waves, or by feedback mechanisms typical of the body’s physiological pathways (akin to immunologic and neuroendocrinologic cascades). In turn, these basic frequencies can re-activate stalled healing processes, enhance growth, accelerate immune responses, and generally “jump-start” functions inherent to the body’s tissues, by “rebalancing its energies” (according to Oriental medicine) or (in Beal’s terminology) by re-configuring the liquid crystal orientation of cell membrane components and thus triggering specific intracellular responses. This article concurs with Pitkanin and Sidorov, that the Schumann resonance may be the substrate for a radar-type extrasensory perception mechanism common to all living beings. Like water bouncing off of rocks and other submerged objects, this non-specific frequency is absorbed and re-radiated in unique interference patterns by all objects it encounters. This interference pattern is a composite of external and internal properties, as the constituent atoms, molecules and their global assembly all re-transmit this energy according to their specific configurations. Not only that, but the “sounding waves” can be frequency and pattern modulated by conscious intent in order to yield specific information (interference patterns). Decoded by the brain they return almost instantly on the “back” of the Schumann Resonance. Once recaptured, the patterns are then decoded by the brain. In this Fourier-type transformation the information is translated into conscious data, much like other sensory processing. Conversely, specific effects may be imprinted as bioinformation and made to exercise a “mysterious action at a distance”, once the signal wave reaches the target. That pattern, in turn, may, under the right (“pre-requisite”) global conditions, avoid routine dissipation and become instead coupled to the dominating (“state-of-consciousness”) standing wave that is picked up and carried by the Schumann resonance. Mental intent may function as a variable window of transmission/reception in the exchange of extrasensory information. Tuned into the Schumann resonance, it may carry such bio-regulating information to distant targets and act as a primitive, radar-type sensory interface. All these and more mechanisms depend on the SR frequencies staying within their median range. In a prior, “first-thoughts” essay discussing the presence of Schumann frequencies in the EEG during various healing practices we had proposed that mental intent might function as a variable window of transmission/ reception in the exchange of extrasensory information, which tuned into the Schumann resonance to carry such bio-regulating information to distant targets and acted as a primitive, radar-type sensory interface (Sidorov 2001). However, pursuing this line of thought soon lead to the landmark experiments of Robert Becker – who, it became evident, had not only reached somewhat similar conclusions based on his own body of evidence, but had gone beyond them to suggest that such subtle currents could reach far deeper into our genetic and consciousness control mechanisms. After nearly eight decades of EEG and other brain imaging studies, it is sobering to realize that we still can’t tell with certainty where EEG voltages come from (Becker 1985, pp 88). It is conceivable that Becker’s perineural system and/or the LC – liquid crystal matrix of the organism (including, but not limited to, connective tissues, cell membranes and DNA) might act as a full-body array of sensory receptors for Pitkanen’s magnetic sensory canvas signals, with specific excitations patterns coding for different types of information. As human beings we have extraordinary potentials we have hardly begun to study much less understand. Creative gifts, intuitions, and talents that are unpredictable or emergent may become stabilized in generations to come. Hopefully, we can learn to understand both our emergence from an essentially electromagnetic environment and facilitate our potential for healing, growth and non-local communication. Adey, W.R., 1990: “Electromagnetic fields and the essence of living systems”. In “Modern Radio Science”, J Bach Anderson Ed., Oxford University Press, 1990, pp 1-37. Beal, J.B. (1996). “Biosystems liquid crystals and potential effects of natural and artificial electromagnetic fields (EMFs). Second Annual Advanced Water Sciences Symposium, Exploratory Session 1, Dallas, TX. Becker, Robert, (1985), Electromagnetism and Life. State University of New York Press, Albany 1982. Becker, Robert, (1990), Cross Currents. The Promise of Electromedicine, the Perils of Electropollution. Torcher, Los Angeles. Bentov, Itzhak, Stalking the Wild Pendulum, E.P Dutton, 1977, Destiny Books (February 1, 1988). Derr, J.S. (presented) & Persinger, M.A. Luminous phenomena, earthquake lights and tectonic strain. Presented at the 4th Annual Meeting of the Society for Scientific Exploration (Princeton University, October 29-31, 1985). Frey, Allan H., (1962). “Human auditory system response to modulated electromagnetic energy”. Journal of Applied Physiology 17: 689–692. Hainsworth, Lewis B., The Effect of Geophysical Phenomena on Human Health, Speculations in Science and Technology, Vol. 6, No. 5. Hainsworth, Lewis B., (1987) Appendix 2, Electrical Technology and Human Evolution, 1987, Speculations in Science and Technology, Vol. 11, No. 2, p. 101. Krippner, S. and Persinger, M.A., (1993). Enhancement of accuracy of telepathic dreams during periods of decreased geomagnetic activity: The William E. experiments. Proceedings of the 36th Annual Parapsychological Association 36th convention (pp. 126-131). Toronto, Canada. Krippner, Stanley, M. A. Persinger, (1989), Dream ESP experiments and geomagnetic activity, The Journal of the American Society for Psychical Research, Vol. 83. Ludwig, H.W., Electromagnetic multiresonance – the basis of homeopathy and biophysical therapy. in Proceedings 42nd Congress Int. Homeopathic Med League, Am. Institute Homeopathy, Washington, D.C. and personal communication with Dr. Ludwig by Dr. Smith, as cited in C.W. Smith, op cit., p. 211. Lysak, R.L., Feedback instability of the ionospheric resonant cavity, J. Geophys. Res.,96(A2), 1553-1568, 1991. Lysak, R.L., Generalized model of the ionospheric Alfvén resonator, Auroral Plasma Dynamics I, in Geopyhys. Monograph Ser., vol. 80 (R.L. Lysak, ed. ), pp. 121-128, American Geophysical Union, Washington, D.D., 1993. Miller, Richard Alan, (2001), “Synthetic Telepathy”, Presented at the Consciousness Technologies Conference, July 20th, 2001. Nickolaenko, A.P. and M. Hayakawa (2002), Resonances in the Earth-Ionosphere Cavity, Kluwer Academic Publishers. Oschman, Energy Medicine, Churchill Livingstone; 1 edition (June 15, 2000). Persinger, M.A. (1989). Psi phenomena and temporal lobe activity: the geomagnetic factor. In L.A. Henkel & R.E. Berger (Eds. ), Research in parapsychology 1988 (pp. 121-156). Metuchen, NJ: Scarecrow Press. Persinger, M.A., & Krippner, S. (1989). Dream ESP experiments and geomagnetic activity. Journal of the American Society of Psychical Research, 83, 101-106. Journal of the American Society for Psychical Research, Vol. 83. Pitkanen, Matti (2002). “A model for remote mental interactions.” JNLRMI, Vol.1 Nr. 2., May 2002. Pitkanin, M, (2013) Comments on the Recent Experiments by the Group of Michael Persinger, Journal of Nonlocality Vol II, Nr 1, June 2013. Pitkanin, M. (2013), “Are dark photons behind biophotons?”, Journal of Nonlocality Vol II, Nr 1, June 2013. Pitkanin, M. (2013), “Two Attempts to Understand PK”, Journal of Nonlocality Vol II, Nr 1, June 2013. Pitkanin, M. (2013), “Quantum Model for the Direct Currents of Becker”, Journal of Nonlocality Vol II, Nr 1, June 2013. Roffey, Leane, The Bioelectronic Basis for “Healing Energies: Charge and Field Effects as a Basis for Complementary Medical Techniques. JNLRMI, Vol. IV (1). Sentman, D.D., and B.J. Fraser, Simultaneous observations of Schumann resonances in California and Australia: Evidence for intensity modulation by the local height of the D region, J. Geophys. Res., 96, 15,973-15984, 1991. Sidorov, Lian, et al, moderators (2013), “The tip of the iceberg: placebo, experimenter expectation and interference phenomena in subconscious information flow, Journal of Nonlocality, Vol. II, Nr. 1, June 2013. Volland, Hans (1995), Handbook of atmospheric electrodynamics, CRC Press. Resonant Cavities and Waveguides in the Ionosphere and Atmosphere. Williams, E., 1985: Large scale charge separation in thunderstorms. J. Geophys. Res., 90, 6013–6025. , 1989: The tripole structure of thunderstorms. J. Geophys. Res., 94, 13 151–13 167.
, 1992: The Schumann resonance: A global tropical thermometer. Science, 256, 1184–1187. , 1994: Global circuit response to seasonal variations in global surface air temperature. Mon. Wea. Rev., 122, 1917–1929. The strong inhomogeneities in plasma parameters in the ionosphere and adjacent regions can trap waves in the upper end of the ULF range (Pc1/Pi1).